A nice boat, lots of fun & a very friendly staff. A nice boat, lots of fun & a very friendly staff. The water was a bit rough but still had a great time. We booked this excursion via the tourism hut in the port in Freeport. We were originally support to go snorkeling through the boat which got canceled ($70 each). Being so close to the fish was a lot of fun. Being so close to the fish was a lot of fun. Hard to use the mouth piece, after a while i just held my breath and didn&apos;t use it. The snorkeling trip was nice. Snorkeling, rock-wall climbing, slide into ocean, food and drink. We went on a snorkeling catamaran that had a slide and climbing wall. We went on a snorkeling catamaran that had a slide and climbing wall. The crew was great and the snorkeling was amazing. Nautical Catamaran & Snorkel - one of the best reefs we&apos;ve been to! 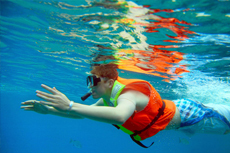 Nautical Catamaran & Snorkel - one of the best reefs we&apos;ve been to! Great staff. Wonderful experience!